A Cry For Justice – Persis shares her thoughts on a book by Jeff Crippen and Anna Wood. The Purge (2013) Official Trailer #1 – This could be excellent, but I’m not sure I’m buying the premise (only one night of criminal activity? seriously?). Still, there could be more to the story than the trailer is revealing, so I’ll withhold judgment until I see the film. If they give more attention to the film’s moral and psychological themes than to the body count, it might be a winner. Manly Character Matters – A stirring testimony to “the enduring power of virtue and character, the world-defying grandeur of fatherhood that kills sin.” Read and be inspired. Why Baptize Babies? – I like this. A lot. 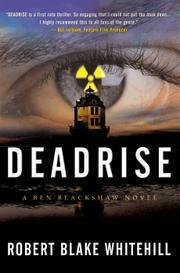 I wrote in January about how much I enjoyed Robert Whitehill’s debut novel, Deadrise. Pirates, buried treasure, stuff that goes boom – what more could a guy want? I had fully intended to feature this interview immediately after my review, but life happened (funny how it does that) and my plans fell by the wayside. Better late than never, though, right? Mr. Whitehill grew up in the Chesapeake Bay area – where the events in Deadrise take place – and earned his B.A. in creative writing at Haverford and Bryn Mawr Colleges. He also trained as an actor at the Royal Academy of Dramatic Art in London, and at The Neighborhood Playhouse School of the Theatre in New York City. His screenwriting has garnered him a number of film festival wins, and he has a feature script currently under option with producer Bill Jarblum (Charley Bartlett, The Little Traitor). Be sure to check out his website at www.robertblakewhitehill.com. TIS: Who or what inspired your interest in writing? RW: My parents inspired me to write. My father wrote award-winning short stories for Ellery Queen and Isaac Asimov’s Science Fiction, as well as two novels. My mother is a wonderful poet, a keen editor, and rich correspondent. They showed me what a writer’s life looks like from day to day, morning to night. They also revealed to me the riches of close attention to the written word. They also read aloud to me, and before I could spell, I fell in love with storytelling. Have you ever read a book where the author was so obviously in love with his subject it just brought a smile to your face? I have. As you turn the pages, you realize that the man behind them doesn’t simply know what he’s talking about it, he loves what he’s talking about. His is no mere cold technical expertise, but a living breathing passion of the “stay up late and talk about it for hours” variety. Tom Wolfe is an author like that and The Right Stuff is a book like that – an epic account of the birth of America’s manned space program, an enthralling character study of seven exceptional Americans, and an adventure story jam packed with thrills. Aviation buffs will love it, but they’re not the only ones. And the writing… boy oh boy, the writing. Smashing stuff. Ambitious, cheeky, poignant, learned, and shimmering with enthusiasm. Wolfe resurrects the past so thoroughly, and with such style, it’s intoxicating. Open this book and you’ll swear you’ve stepped into another age: The Space Age. The book is written from several perspectives, beginning with that of Jane Conrad, a test pilot’s wife, as she grapples with the horrific possibility that her husband has perished in a plane crash. Wolfe then moves on to the legendary Chuck Yeager and his exploits in breaking the sound barrier. The perspective shifts once more as we’re introduced to the seven astronauts of Project Mercury: Alan Shepard, Gus Grissom, John Glenn, Scott Carpenter, Wally Schirra, Gordon Cooper, and Deke Slayton. As to just what this ineffable quality was… well, it obviously involved bravery. But it was not bravery in the simple sense of being willing to risk your life… any fool could do that… No, the idea… seemed to be that a man should have the ability to go up in a hurtling piece of machinery and put his hide on the line and then have the moxie, the reflexes, the experience, the coolness, to pull it back in the last yawning moment – and then to go up again the next day, and the next day, and every next day… There was a seemingly infinite series of tests… a dizzy progression of steps and ledges… a pyramid extraordinarily high and steep; and the idea was to prove at every foot of the way up that pyramid that you were one of the elected and anointed ones who had the right stuff and could move higher and higher and even – ultimately, God willing, one day – that you might be able to join that special few at the very top, that elite who had the capacity to bring tears to men’s eyes, the very Brotherhood of the Right Stuff itself. MovieByte: Oblivion – An encouraging review. I’ve been looking forward to this one for awhile now, and intend see it sometime this weekend. Be sure to read Chad’s review as well. The Humble Pope – Good words to consider. One Additional Thought on Paedocommunion – A hearty amen to this excellent piece.